USBA Champion Derek Ennis and mandatory challenger Gabriel Rosado weighed at the South Philly Arena one night before their big 12-rounder. Both combatants tipped the scales at 153 pounds even. That's one pound under the junior middleweight limit of 154. They will face off around 10PM Friday night in the biggest and most anticipated Philadelphia fight in years. The South Philly Arena was still sleeping on Thursday evening, and not yet ready for the big event. The lights were dim. The ring was undressed. Only a few chairs were set up. However, in twenty-four hours the place will be bristling with boxing fans with high expectations. It remains to be seen whether the boxers can produce a fight memorable enough to place among the numerous standout bouts in Philly's fine ring history. But this one has a good start and a decent chance to make the list. Ennis and Rosado both looked extremely fit and ready for battle at the weigh in. 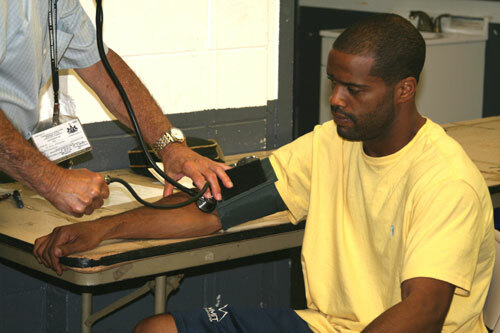 They cruised through their pre-fight medical exams and waited for the call to hit the scales. When they stepped up on the scale, Rosado first and Ennis right after, their weights were identical - 153 even - further thickening the plot line that says this match is a toss up. The fighters posed for photos and exchanged handshakes. Their respective teams also cordially wished each other well. PA Commission Executive Director Greg Sirb announced the weights, along with the names of the officials assigned to the main event. Referee Gary Rosato will be the third man in the ring, while George Hill, Pierre Benoist and Joe Pasquale will be the judges. 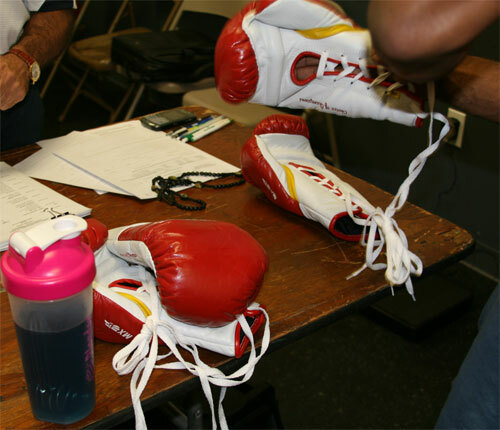 The fighters chose their gloves (red, white and yellow Everlast Pro Mex) and the mood continued to be loose until someone in the Ennis camp noticed the gloves were 8 ounce models, instead of the 10 ouncers they expected. 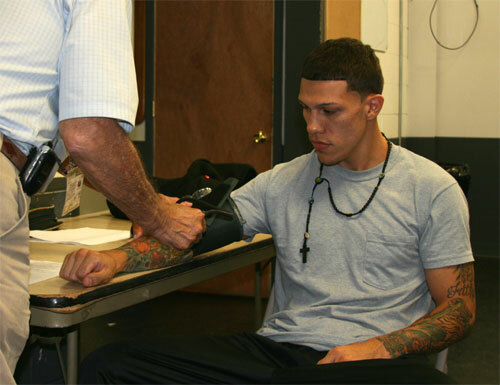 PA regulations state that 10 ounce gloves are to be used for bouts above the welterweight limit. However, after a quick check of the contracts and rulebooks, the commission explained that since this fight is sanctioned by the USBA, their rules trump those of the Keystone State. The Ennis camp grumbled about the decision. They were at the very least surprised by the fact that the smaller gloves would be used. Given their man is not the puncher between the two, they seemed to be feeling as if they'd been wronged. Team Ennis hung around discussing the issue with themselves, the promoter and the commission. But the decision stuck. The Rosado camp, thrilled with the smaller gloves, exited the South Philly Arena quickly and quietly, presumably feeling the decision had offered them an edge. And they were gone before any more was said about the mini-controversy. Call it round one for Rosado. But this fight is still a close one, and any real advantage between the two top junior middleweights in Philadelphia will have to be played out in the ring Friday night.